I had to leave the refuge early as one of my dogs had to go to the vet for an emergency grass-seed-from-nose extraction. However when I left things were not going well. 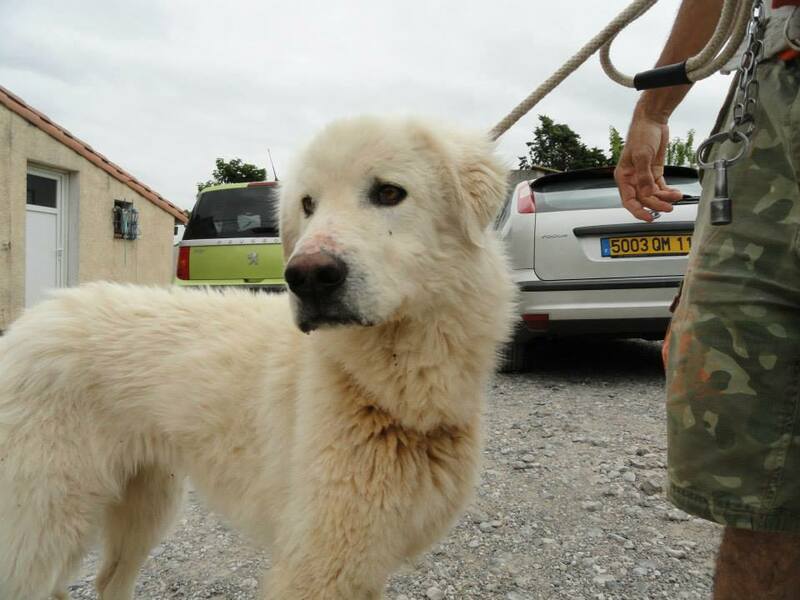 Four dogs had been brought in, one of whom is a Pyrenean Mountain dog, who arrived weighing 26kg rather than the 50kg that he should be. His toenails are so long they are curled back on themselves. A sad sight indeed. We will soon have Hoffen up on his paws and the change in him will be dramatic, but how sad that such a magnificent creature should be allowed to get into this state. We suspect that his toenails have grown this way due to Hoffen having been enclosed in a small space; let’s hope he is soon adopted and really understands the meaning of freedom! 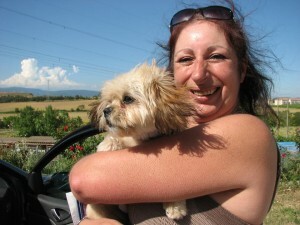 On the plus side, a lovely couple came to adopt Chanel, who was abandoned by her owner a couple of weeks ago. 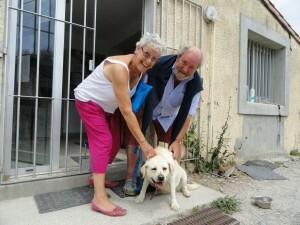 This couple travelled a long way and were delighted with their new dog. Happy smiling faces all round! Just look at Chanel. I love the French expression to “have the banana”, but it is only when you see dogs smiling like this that you understand it properly! And yes, we know that Chanel has the opposite problem to Hoffen, but a sensible diet and more exercise will do wonders and I have been promised photos once Chanel is back to her slimline self! The other BIG adoption of the day was that of Grizzli. 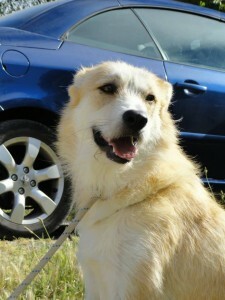 He is going to have a lovely time in his new home and it is great that his time at the refuge was so brief. Let’s hope Hoffen is as lucky! I am off for a week or so, leaving you in the capable blogging hands of Moira. Looking forward to lots of good news when I get back! Cool days await old dog! I don’t know about where you are, but today in Carcassonne it has been absolutely baking hot. Wonderful as this is for tourists and those lucky enough to be living a life of leisure, my thoughts always turn towards the dogs at the refuge. For reasons of hygiene, the kennels are made of concrete, and you can just imagine how hot these are in this kind of heat. The staff hose down the kennels as often as possible. Some dogs lie under the spray, others wait in the dry, but emerge once their outside area is a bit fresher. The dogs who suffer the most are undoubtedly the oldies, so I was delighted to hear the news that Tammy was adopted today. Tammy is 13 years old, brought in at the end of May, with a severe heart murmur. The vet told us that her condition meant that sterilisation was not possible, so we had to find a family with no male dogs and no risk of unwanted male visitors. Our good friends at Doglinks (who have a very soft spot for the oldies) will be delighted at the news that today Tammy was homed so she will be out of the baking heat of the SPA! 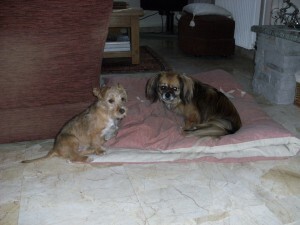 More good news came in the form of the first photos of Boza (now Enzo) in his new home. And only one dog arrived today, so fingers crossed it will be a good week! Oh, and we had a visit from Minnie, who was homed a couple of weeks ago. Hector rediscovers his Joie de Vivre! Even though it has been four weeks since our last Open Sunday, today is still June, so it is not until next week that the SPA will be open. The volunteers have itchy feet, but we have left the dogs to their own devices today, and any the work has been going on behind the scenes. 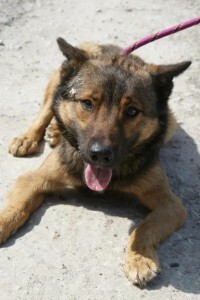 We have had early news of Sunny, adopted yesterday and already proving to be a little star, with no overnight puddles! Good girl, she knows that she has landed on her paws! In the relative elation of yesterday’s six adoptions, I failed to mention one major event. Well, major for us at least. 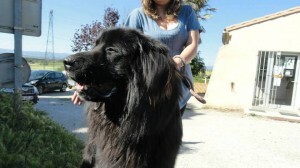 This was the first walk for Hector since he was abandoned at the SPA on June 10th. You may remember from an earlier blog that Hector was found at the gates having been adopted from the SPA three months ago. When we contacted his owners (to give them the wonderful news that their lost dog was safe and was waiting to be collected at the SPA), they told us that Hector had had three epileptic fits over the weekend and rather than take him to the vet, they were abandoning him. Since this time Hector been lying immobile in his cage, apart from a visit to the vet, who assessed him as having a problem with his prostate. This will be cured by castration, and could have been the cause of his fits; not epilepsy at all. 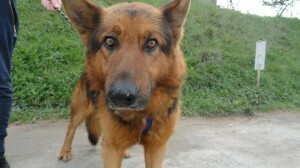 But Hector’s owners are not worthy of him, so even if they were to reconsider, we would not return him to them. Yesterday Hector was on his feet and so we seized the opportunity to take him out. I was amazed by how quickly he cheered up. 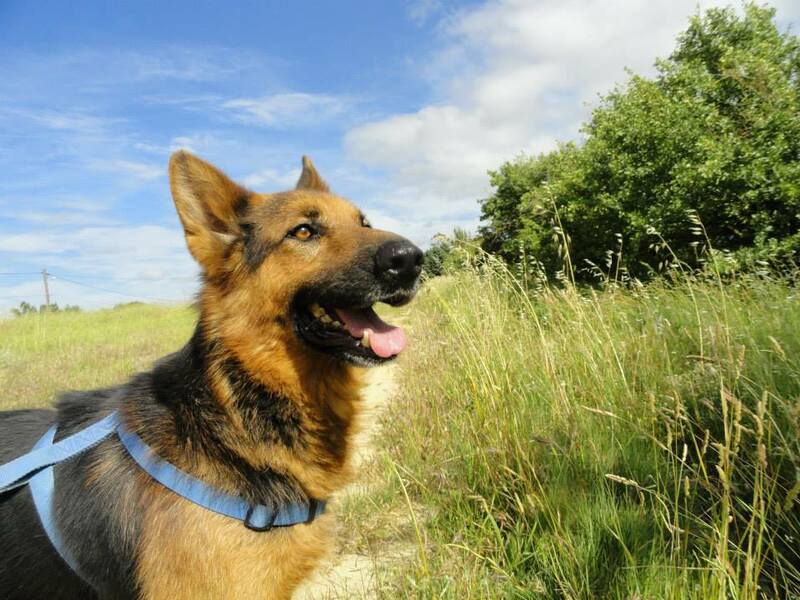 He seems fearful towards other dogs, so we will work on that, but otherwise he is the perfect dog, no pulling on the lead and happy to rediscover the joys of life after his horrible experience! As I have said on so many occasions, some people simply don’t deserve dogs! Six adoptions today, which was a bit of a morale booster after some tough times of late. The first of today’s departures was particularly good news, as it was that of Boza. You may remember this little chap. He arrived on May 28th at the age of about four weeks and in a dreadful state. He was infested with worms and was severely dehydrated. Even the vet wondered if he would pull through. Luckily one of our foster families just happens to be a veterinary nurse, and she and her husband took Boza home. I saw him today and what a change! 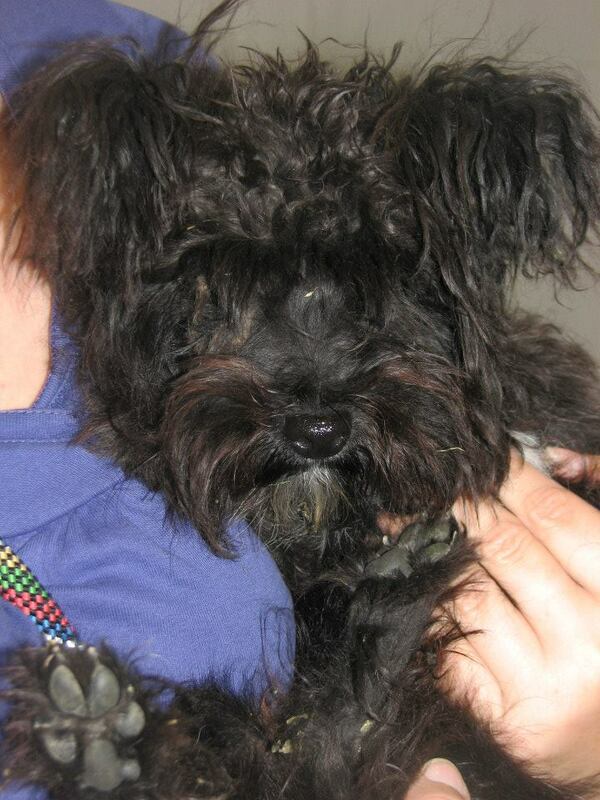 He is a fabulous little chap and is going to have a great life with his new family and new doggy friends. Thanks Lisa and Andrew! The second adoption was that of Sunny, also to a British family and she was closely followed out of the refuge gates by Nefertiti, Sioux, Falco and little Lisi. 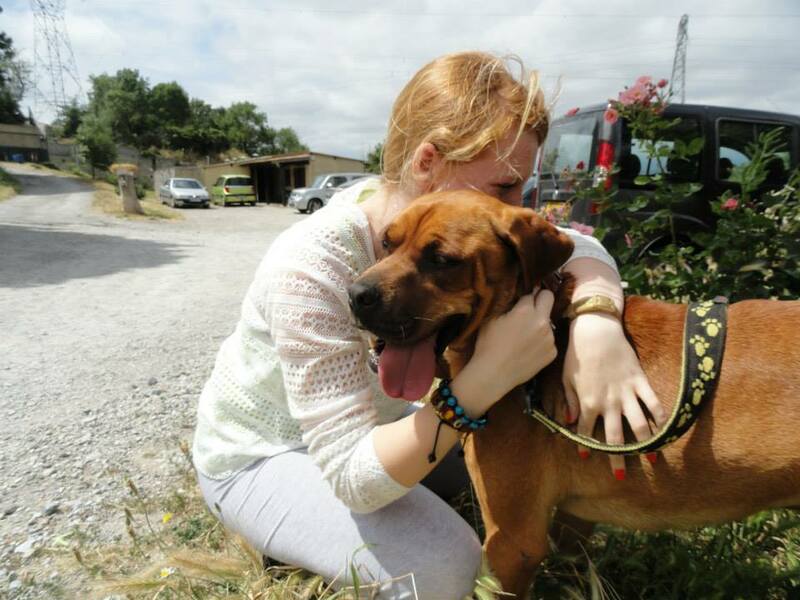 It was hard to see Falco go, as he was the favourite dog of one of our young volunteers, Tiffany. She was in a similar state to me a couple of weeks ago when Ripley left, and I was in tears watching her! We want them all to leave, but we get so attached to some of them! 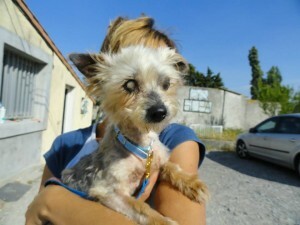 Of course it was not all good news, with the arrival of one dog, abandoned by the son of her sick and elderly owners. But Manon is pretty so we hope she will find a home before too long, although there is some work to do on her socialisation. 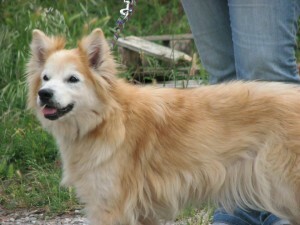 The weather was good, so lots of dogs were walked and several new volunteers came along. All on all, not a bad day! Despite the wonderful news of the adoption of Tala, who had deformed front legs which we thought would hinder his adoption, I have been in a terrible mood all day. 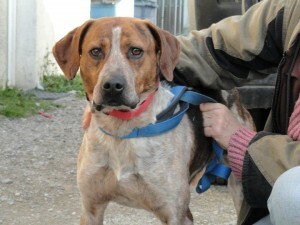 No, not because of the two puppies that were dumped, nor the mistreated braque brought in by our cruelty inspector. What has really made me angry an article in this morning’s La Depeche concerning Kitty. She, if you remember, was brought to the SPA in a terrible state at the end of May. A journalist came to the SPA to speak to me about this yesterday, as Kitty’s owner had contacted La Depeche to inform them that she is taking us to court for fraud because we are refusing to return her dog. On the basis that we have clear proof of the dog’s mistreatment (photographs and a veterinary certificate), I was at least a little bit hopeful that the newspaper article would be favourable towards the SPA and our desire to save mistreated animals. However I should have known better, especially when I told our side of the story and the journalist said “Oh, but that is not what the dog’s owners told us”. Well, what a surprise? Who goes to the press and says “I have been neglecting my dog for years and now I want it back so I can neglect it some more”? I also tried to explain to the journalist that it is not in our interest to keep a dog that has a good home. We already have too many unwanted dogs. He left this bit out, of course. I apologise if any of you are members of the Fourth Estate, but at the moment I have a very low opinion of journalists. Kitty had an abscess in a tooth that had become so infected that she has a hole underneath her eye. Fur so thick and matted that she could not walk. Why do people who treat their animals like this even want a pet? If she had put in as much effort to her dog’s well-being as she is in trying to get her back, Kitty would not be in this mess. Tonight I am very low, and I fear the worst for Kitty. 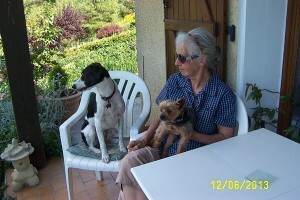 The Brigitte Bardot Foundation has been contacted as has the Association Stéphane Lamart. Both have promised to support us and we hope that this helps keep poor Kitty safe. Please publicise this as much as you can. And if you have any ideas as to how to help, please get in touch! For you French speakers, here is a link to the article, in all its glory. The woman is named, but not shamed. 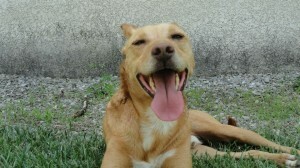 Tala is much luckier, she has found a GOOD HOME. This is all we want for our dogs! Two tiny little dogs arrived today, one looking like a doormat. In fact so much so that when she came back from the vet, I didn’t even realise it was the same dog! This little girl is 13 years old and is micro-chipped, but somehow I don’t think her owners are interested in reclaiming her; they are certainly not answering their phone! As you can see from the photos, Lola is blind in one eye, and despite the availability of the puppy house (the puppies are in the infirmary and in the cat house, for reasons I won’t go into! ), Lola was not going to have a great time at the refuge. Then a saviour arrived; a good friend of one of our worker/volunteers. 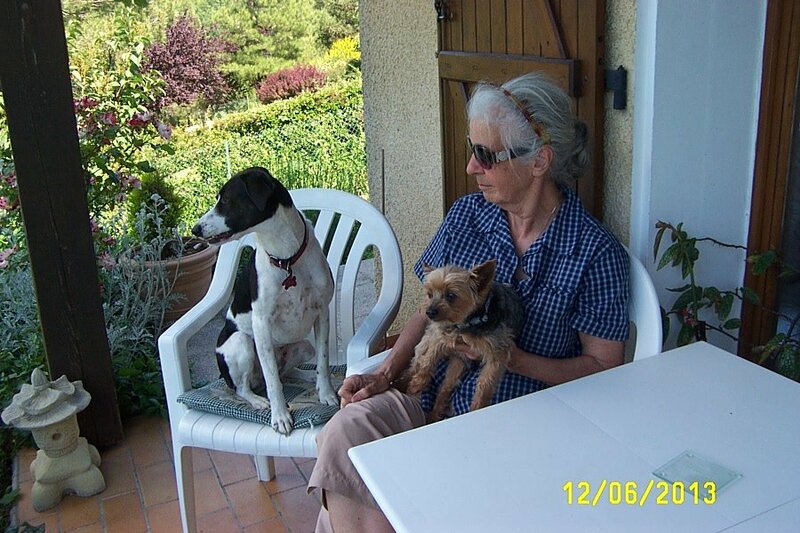 So Lola has gone to a family home while we look for either her owners or someone who has a heart big enough to adopt this elderly but extremely lively lady. She trotted off trying to play with her lead, like a labrador puppy! 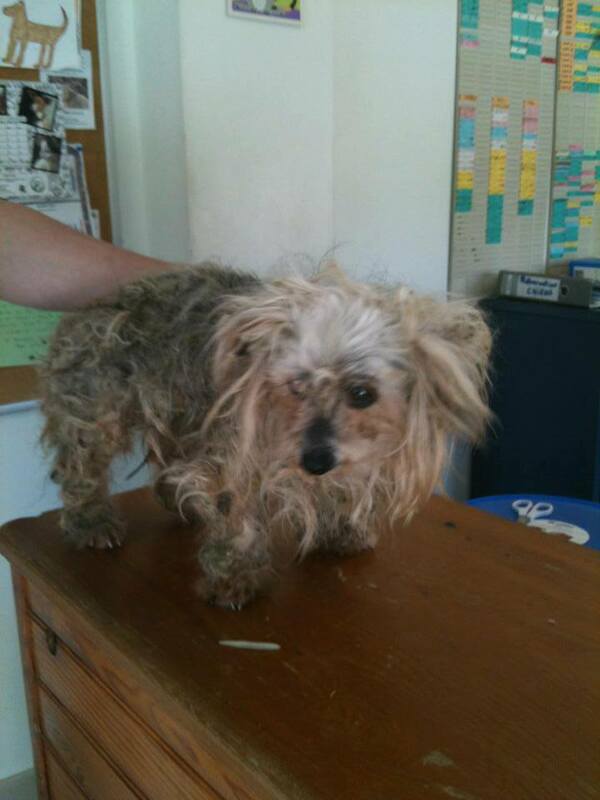 The other little girl is in fine condition but is not identified. In ten days time she will be up for adoption! So that is the arrivals dealt with; how about the departures? Only one, but it was a good one. Not only because we know the adopter, so it is not a fickle “I want a dog of this breed” flash in the pan. 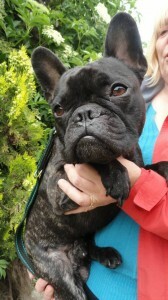 Also because we will no longer have what sounds like either a goat or a snorting pig in the infirmary, as this is what Fonzy, our French bulldog sounded like, depending on his mood. We will miss him, but it will be much quieter without him! There were a couple of reservations, too. But I am superstitious about posting too early, as you know! Today was much quieter at the SPA, you will be pleased to hear. We can’t take in five new dogs every day, after all! 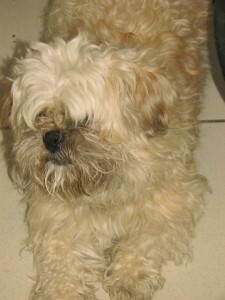 One dog did arrive, but he is identified and the general feeling is that he will be reclaimed, fingers crossed. He is a black lab called Nero, exactly like my boy, (who is lying devotedly at my feet) and was adopted from the SPA about a year ago, so I hope he has not been deliberately lost. As well as answering emails about the dogs, I was lucky enough to spend several hours in the company of Harley. His foster family came over to pick some cherries from my tree, bringing Harley and their own dog, adopted from the SPA, with them. Harley is going to be my urgent appeal this week, and I assure you that he is a fabulous dog. He got straight into play mode with my dogs, and I can only assume that he, like my pack, is now fast asleep. I have two males (one dominant, one non-dominant) and two females (ditto) and he was fine with all of them. His foster family have children of 2, 4 and 6 plus cats, so Harley has really been put through his paces. It is time for him to find him his own family, though, and this time it has to be for ever. Let me know if you would like any more information. I would happily take him except someone (not me) thinks that four dogs is more than enough. Grrr! The other nice thing today was a lovely email received from a woman in England who adopted a dog from us just over 2 months ago, sight unseen. The adoption of Munro has been an unqualified success and her narrative really made me smile. 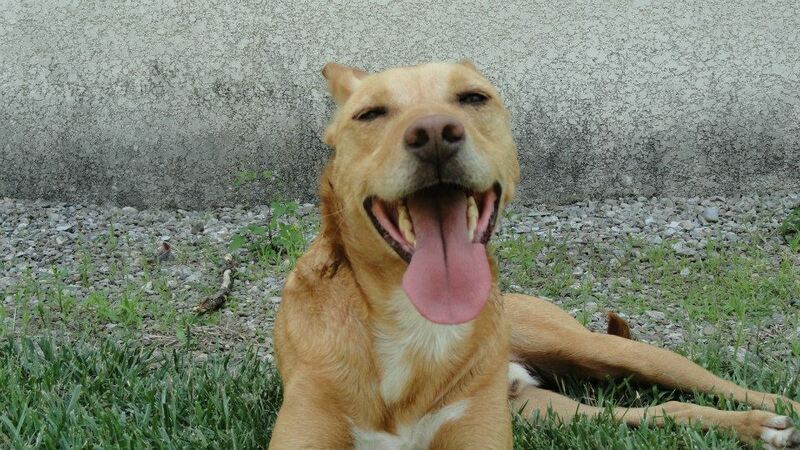 When times are bleak it is sometimes difficult to remember the dogs that are now living happy lives. Today was one of the days that I just dread. 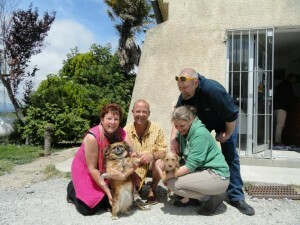 I arrived at the refuge at just after opening time to be told that 5 dogs had arrived already. It was clearly not going to be a good afternoon. It is possible that some of the dogs are lost and that their owners will look for them, but seeing the state of a couple of them, this is not very likely. 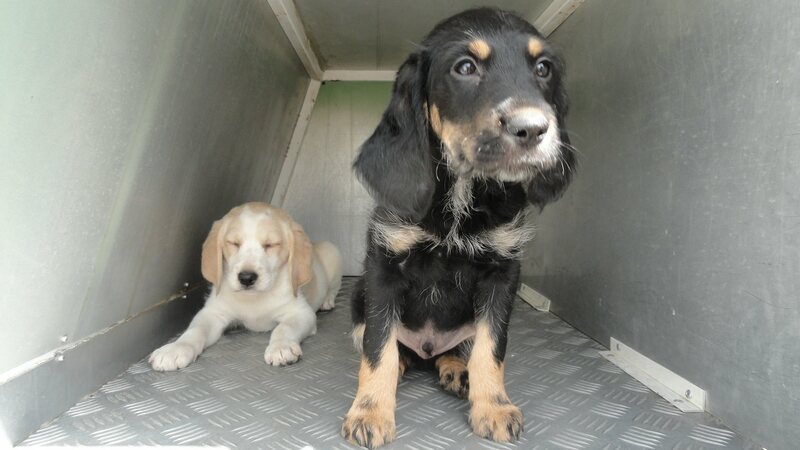 And two of them are young puppies, obviously from an unwanted litter. I would like to think that the dog’s owners have learned a lesson and will now have her sterilised, but in my heart I know otherwise. However we have to keep going, even when things are grim. 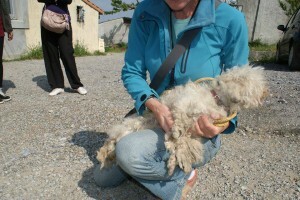 The resident dogs still need walking and there were several volunteers on hand to help. One girl was awaiting the arrival of her cat from his vet visit, and she is our newest dog-walking recruit! We also had a very VERY good adoption today. After nearly 8 months at the refuge, our lovely border collie, Falco, finally found a new home. He is going to be so happy, he has a new girlfriend (don’t tell him that he has been castrated!) and will be living in a fully enclosed garden with a very active retired couple. The husband used to be a dog handler and they still do long long walks every day. Lucky Falco. His adoption was thanks to a couple of French volunteers, Laurene and Dominique, who write short articles for the local press; not all of them hit the mark, but this one certainly did! Thanks girls! Sadly Falco’s long term kennel mate, Bond, is now left behind. We found him a new friend to share with, but it would be nice if someone would notice him, too! Perhaps another press article beckons!!! Today I popped to the vet to make an appointment for one of my pack where I met a dog who had been adopted from us about seven months ago, so I had a cuddle. I then went to a local garden centre where the cashier (who is a SPA supporter) told me that she had found an injured kitten on the ring-road last night and she would be bringing it in this afternoon. The man next in the queue then realised who I was, and started asking me questions about what to do about the stray animals in his village. If anyone has a false beard and sunglasses I can borrow it would be nice! There is a French poster circulating on the Facebook (where the SPA Carcassonne is very active; if you don’t yet follow us, please do so, www.facebook.com/SPA.CARCASSONNE . ) One of our computer-savvy volunteers has changed the photo to show three of our own animals, Bond, Baileys and Carole (the cat, not the secretary!). The text has also been translated into English, so I am posting it here and asking you to spread the message. Not buying puppies from anyone other than registered and reputable breeders is the key to solving the whole mess we are in. 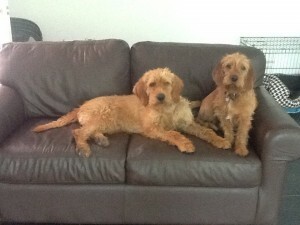 Here are a photo of the two new arrivals; details on them both will arrive in due course! Guess we were are having a breakfast cereal theme day! 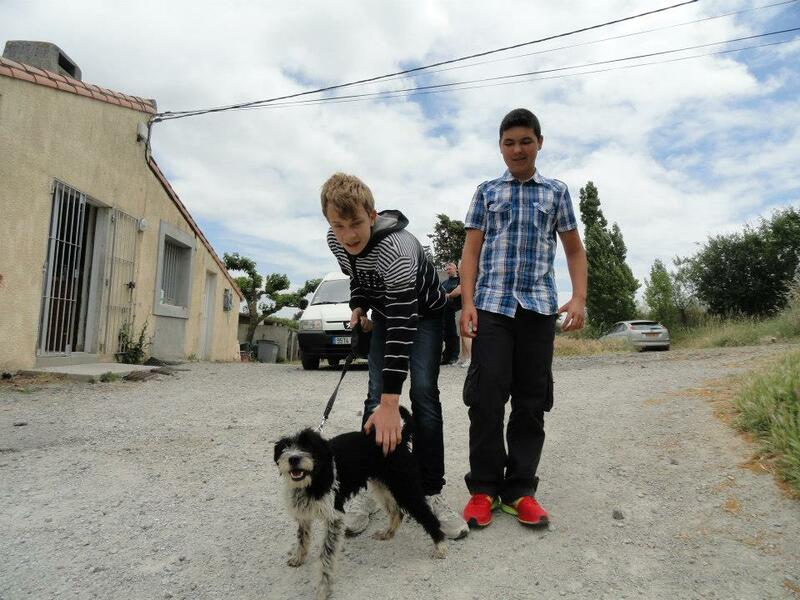 Several months ago a couple of a certain age, as they say in France, arrived at the refuge to adopt a dog as a playmate for their own dog. I chatted to them briefly and told asked them to do the tour of the refuge to see who they liked the look of before making any introductions. They returned shortly afterwards to ask about a little old Yorkie who was cowering in his box, having recently arrived at the refuge. Fred and Margaret have a soft spot for Yorkies, having had them before. 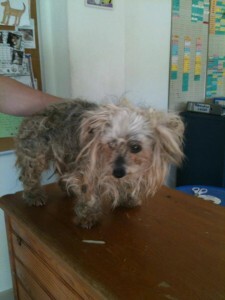 They left the refuge with heavy hearts, as adopting an old dog was not at all what they had planned. However the next day, unable to get Alfie (or Flamenco as he then was) off their minds, they came to the refuge to take him home to foster. This means that Alfie (who would have been extremely difficult to home, due to his age and the inevitable vets bills) has a loving home, and Fred and Margaret are to all intents and purposes his owners. This was the start of Fred and Margaret’s devotion to the SPA. Fred is often to be seen at Vide Greniers, including the one at Esperaza last week, getting up at truly unearthly hours to catch the punters, and all their “earnings” are sent to us at the refuge. 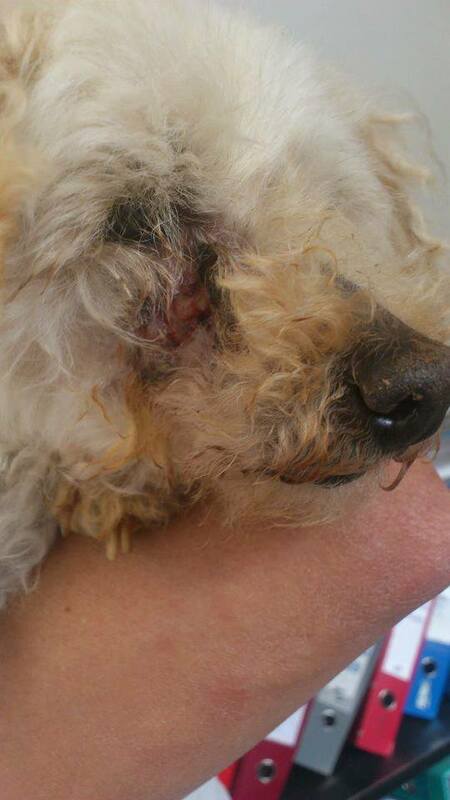 We get regular updates and photos, and Alfie gets treatment from the SPA vet. 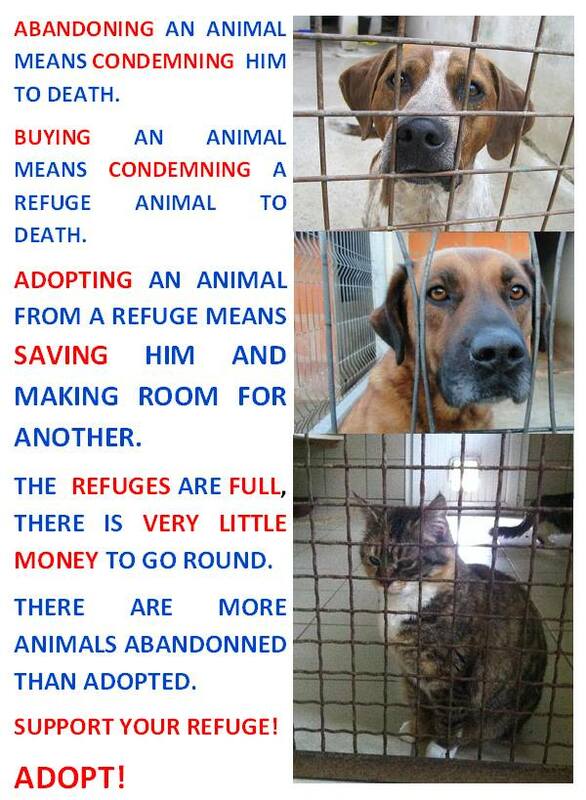 Fred’s donations easily cover Alfie’s bills, and everyone is happy, especially, I suspect, a certain Yorkie! Now we do not expect this from all our foster families. Some of them act as short term homes for puppies or dogs who have behavioural problems. However it is a fabulous arrangement, and I salute Fred and Margaret for their commitment to Alfie and the SPA. If you spot him at any vide greniers, go and say hi. And if you have anything you would like to donate to be “car-booted”, you know where to bring it!